Ah, the kangaroo, such a versatile animal. Enticer of tourists, chastiser of small children – one once gave a two year old Muffet a well deserved slap for squeezing its nose, I should have gone to help, but I was too busy crying with laughter. Its claws mounted on a stick make an excellent backscratcher or a hit TV series, and its scrotum may be fashioned into a handy coin purse. It also makes a rather terrific pie. I like to make individual pies, especially for nights like last night where a fair amount of coming and going for sport around dinner time is involved. You can just hand a pie to whichever child is heading out the door and they can eat it on the way. First, remove your pastry from the freezer. Yes, I am using frozen pastry, I am certainly not making puff pastry on a school night, or possibly any other night either. It’s on my to do list. 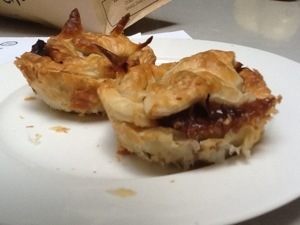 I find the only problem with frozen pastry is I can’t tell whether it’s shortcrust or puff if I’ve thrown the box away. Fortunately this was puff. Tradition has it that you use shortcrust on the bottom and puff for the lid, but suit yourself, we prefer puff all over. Chop about 600 grams of kangaroo into small dice. Much though I loathe the mega supermarkets, they do stock Macro Meats range of kangaroo and what I use for pie is the bush plum marinated kangaroo steak. Stick the kangaroo dice into a small saucepan with about three teaspoons of cornflour and stir about over high heat until browned. I find the marinated meat doesn’t need extra oil, but if you’re going with plain kangaroo from the back of the ute I’d advise adding a little butter. I then add half a cup of chicken stock straight from the freezer (remember when we made that a couple of weeks ago? ), the leaves from a stick of rosemary and about a tablespoon of grated fresh ginger, but you can really suit yourself. Normal people might also add finely diced carrot, celery and/or mushroom, or even shredded beetroot goes well with kangaroo. Of course, then I would have a lot of leftover pie, so I desist. Simmer it covered, stirring occasionally, for about an hour. When you’re having a break from stirring, get out your muffin tray and start spraying liberally with olive oil. There’s no way your muffin pans are non-stick, whatever they say on the label, unless they’re silicone, and I still feel a bit odd about using that. Cut out twelve large circles from your pastry and line the muffin cups with it. You don’t need to blind bake it. When the meat is ready, ladle it in. If the gravy is a bit runny still, take the lid off the saucepan of meat and turn up the heat for about five minutes, stirring a lot. You can then cut out neat smaller circles to use as lids, but I, being a thrifty housewife, just pile on the scraps leftover from cutting out the circles. You don’t even have to cover the meat completely. You could also cover the meat with mashed potato. Bake in a hot oven for ten to fifteen minutes. You’re only cooking the pastry, so you can blast it at 220 degrees C. Take it out when the pastry is browned, then spend the next ten minutes cursing them out of the pans with the aid of a large fork, vowing to use more oil next time. The Horror asked if he could have a pie with no meat inside, but ended up eating two quite happily. I’m going to have to make more than twelve next time, especially as they’re rather good for lunch the next day.